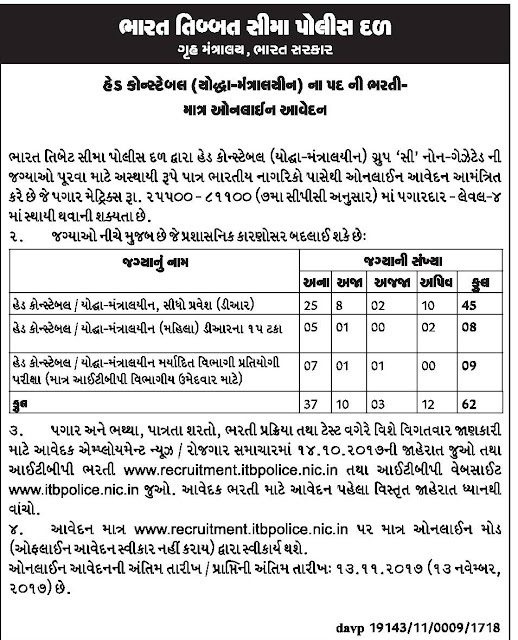 Indo Tibetan Border Police Force (ITBP) has published Advertisement for below mentioned Posts 2017. Other details like age limit, educational qualification, selection process, application fee and how to apply are given below. Pay Scale Details: Candidates should pay scale Rs. Level 4 in Pay Matrix Rs. 25500-81100/- (as per 7th CPC). Application Fee: Male candidates belonging to General (UR)/OBC category applying for recruitment to the above posts should pay Rs 100/- (Rupees One hundred only) as application fee only through the online payment gateway system on www.recruitment.itbpolice.nic.in. Candidates belonging to Scheduled Caste, Scheduled Tribe, Females and Ex-servicemen are exempted from paying the fee. Selection Process: Candidates have to remember that they are going to face the Written Test, Physical Test, and Medical Test. Aspirants will be passed to the Physical Test only if they Clear the Written Test and same to the Medical Test. They will be forwarded to the Medical Test only if pass the Physical Test. After all the Rounds the Indo Tibetan Border Police will release a Final Merit List in which they will mention the Names of all the Candidates who had successfully cleared all the rounds and got placed as the Head Constable in the Indo Tibetan Border Police Recruitment 2017.